Home-dried herbs are much more colorful and flavorful than their store-bought counterparts. Drying herbs is a great way to preserve your herb garden's abundance or to use up the rest of that bunch of fresh herbs you bought and only used a sprig of. Herbs get their scents and flavors from essential oils; an herb that doesn't smell like anything isn't going to taste like much of anything. Essential oils are extremely volatile and evaporate easily when exposed to light and heat. So the goal is to dry aromatic herbs quickly exposing them to much light or heat. If you are collecting herbs for drying from your own garden, it makes sense to harvest them at the time of day when their essential oil content is at its highest. The herb gardening books often describe this rather poetically, e.g. "Harvest your herbs in the morning just after the dew has dried." This actually makes sense when you consider that wet herbs might mold before they dry ("...wait till after the dew has dried"), and that morning is when their essential oil content is at its peak. During the heat of a summer afternoon, some of those oils evaporate. If you're enjoying the scent of lavender as you walk by the plants, keep in mind that the oils you're smelling are in the air, no longer in the plant. Overnight, the plants replenish the essential oils they gave up to the heat of the afternoon. Realistically, you may only have time to gather your herbs in the afternoon or evening. They will still be good, just not quite as good as they would have been in the morning. Some herbs do not dry well and are best preserved by other methods. Herbs that do not dry well include parsley, chervil, cilantro (coriander), rosemary (unless you like the texture of chewing on pine needles), chives, and basil. These herbs keep their flavors when made into herbal salts and herbal vinegars. This method works well with any leafy herb except for the ones mentioned above. Use a rubber band to hold the stem ends of 8 to 10 sprigs of leafy herbs together. The rubber band is important: the stems will shrink as they dry, and if you use string, the sprigs will slip out and land on your floor. Hang the herbs where they can dry away from direct light or heat. After a week they should be crispy-dry and the leaves should crumble easily off the stems. Strip the leaves from the stems. Compost or discard the stems. Store the dried herbs in tightly covered glass jars, again away from direct light or heat. If after a week your herbs are not dry enough to crumble easily, put them in your oven on the lowest temperature for no longer than 5 minutes. Remember, we want to minimize the time the herbs are exposed to heat. Let the herbs cool at room temperature for 5 minutes before transferring to jars. Note: the herbs will crisp up as they cool just the way cookies do when they come out of the oven. For large-leaved herbs such as sage, strip the leaves from their stems. 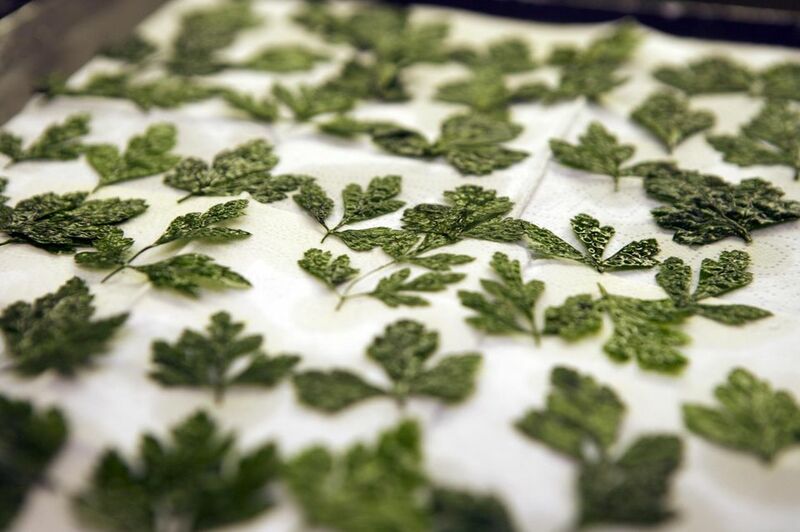 Spread the leaves (or sprigs of small-leaved herbs such as thyme) in single layers on dehydrator trays. Dry at 95 F/35 C until crispy-dry. This will take 2 to 8 hours depending on the thickness of the leaves and the humidity in the air. Check approximately every 2 hours to see if the herbs are dry yet. If you dried small-leaved herbs such as thyme, strip the leaves from their stems after they are dried. Transfer the dried herbs to glass jars. Cover tightly and store away from direct light or heat. Dried leafy herbs will keep their flavor for up to 1 year, but are best if used within 6 months.